Retail inspired and quality made! The 12 oz. CeramiSteel Logo Tumbler with Lid is extremely durable and has a ceramic coated liner that will not break, crack or chip! Once you drink from CeramiSteel you may never want to go back to plain stainless! Corkcicle Canteen Custom Bottle - 25 oz. 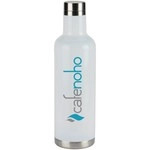 Keep beverages cold for 25 hours or warm for 12 hours in this Corkcicle Canteen Custom Bottle! It's crafted from stainless steel with proprietary triple insulation. Vacuum Insulated Wood Grain Tapered Promotional Tumbler - 20 oz. Show off your company logo with these Vacuum Insulated Promotional Tumblers with wood grain design. Shop now for unique custom drinkware.